Front line 2 bed apartment Oura Beach - Property for sale. 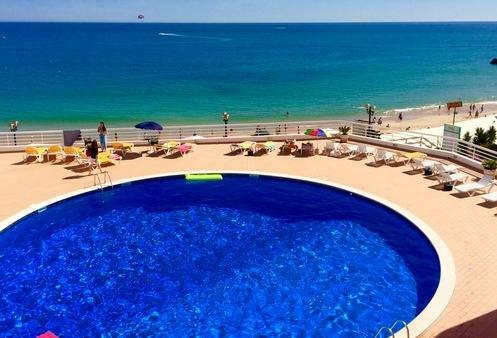 Full Description: A unique opportunity to acquire a front line apartment, with stunning uninterrupted views of the sea, just 30 metres from Oura beach in Albufeira. The apartment has 2 bedrooms, comes fully furnished and equipped and is in a much sought after private hotel complex built directly on the beach. With plenty of facilities and all amenities right on your doorstep, the location is perfect for holidays without the need of a car. Rarely do opportunities arise in this area, so understandably come at a premium, especially with this view, however rental returns are excellent! Located on the 3rd floor the apartment is very well presented with bright modern decor and new furnishings. Accommodation comprises an open plan lounge/kitchen/dining room with plenty of storage and doors out to a spacious South facing sun terrace with magnificent sea view, 2 double bedrooms with fitted mirrored wardrobes, one with doors to the same terrace, full bathroom. There is air conditioning in the lounge, dimmer switches on all lights, double glazed windows throughout and shutters on all doors and windows. The view from the terrace is wonderful and really must be seen to appreciate fully and it's perfect for al-fresco dining and having a few drinks whilst watching the people around the swimming pool or the squid fishermen at night out at sea. The complex itself has facilities including two communal swimming pools, one indoor with Jacuzzis, the other is an outdoor pool with sun beds, year round reception area plus a variety of shops, supermarket, bakery, bars and restaurants. For those with a car the apartment also benefits from a private remote entry closed garage, which in the Summer months is a must as parking can be difficult near the beach when busy. This is a lovely apartment in a premium location and viewing is highly recommended.